Need help printing to your 1099s or W-2s? Once you have your IRS-provided forms, all you have to do is line up your numbers with the boxes. Back during the age of the typewriter, that was easy. With a printer it's a different story. You can end up pulling your hair out trying to line them up right - unless you have a template. You'd think such templates would be all over the Web. Surprisingly they aren't. So we created 1099-MISC and W-2 templates for Word. Simply key in (or copy and paste) the numbers into the appropriate boxes, and you're about ready to print. To order one or more templates, click the link(s) at left. Upon checkout you'll be taken to a download page. You'll receive an e-mail with the download links as well. Included will be a 1096 or W-3 template at no extra charge. 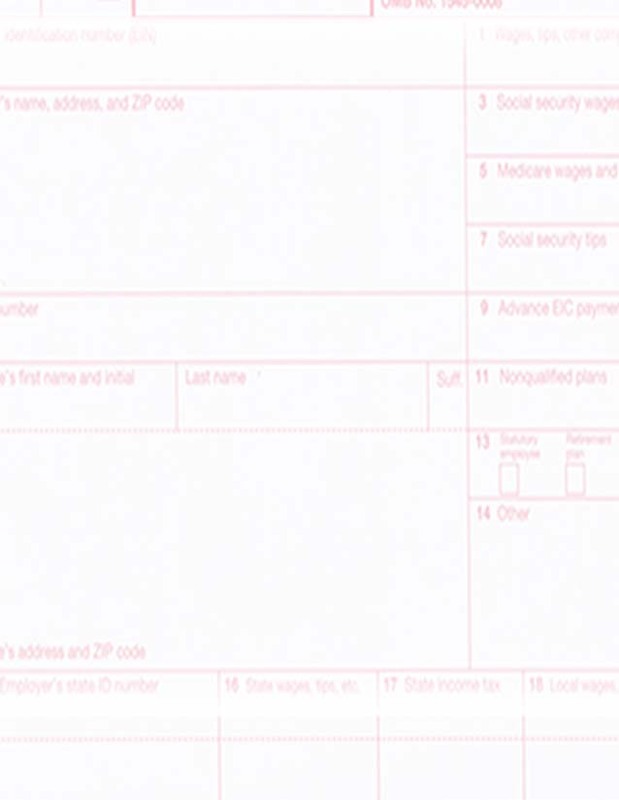 Note that these are not the actual IRS forms; only the templates to help you print onto them. You can perform a data merge with the template. If you have several recipients and don't want to copy and paste for each one, you can merge the data from your spreadsheet using Word's Mail Merge toolbar, and thus create a document containing multiple unique pages. The templates are for the 2017 forms, and they may work for previous-year forms as well. NOTE: While the templates have worked fine for the vast majority of past customers, a few have experienced alignment and/or layout problems due to the characteristics of their printer, their operating system, version of Word - particularly Word 2007 - or other factors. Therefore before printing to the actual tax forms, it is important to print a test page by printing to a blank sheet and overlaying it onto the form in order to ensure proper alignment. If you do experience problems, contact us. These templates were successfully tested with Word 2003 through 2013. When issues arise, they usually involve Word 2007. If that's the case for you, please request our alternative template. Below is a partial screenshot of what you'll receive. 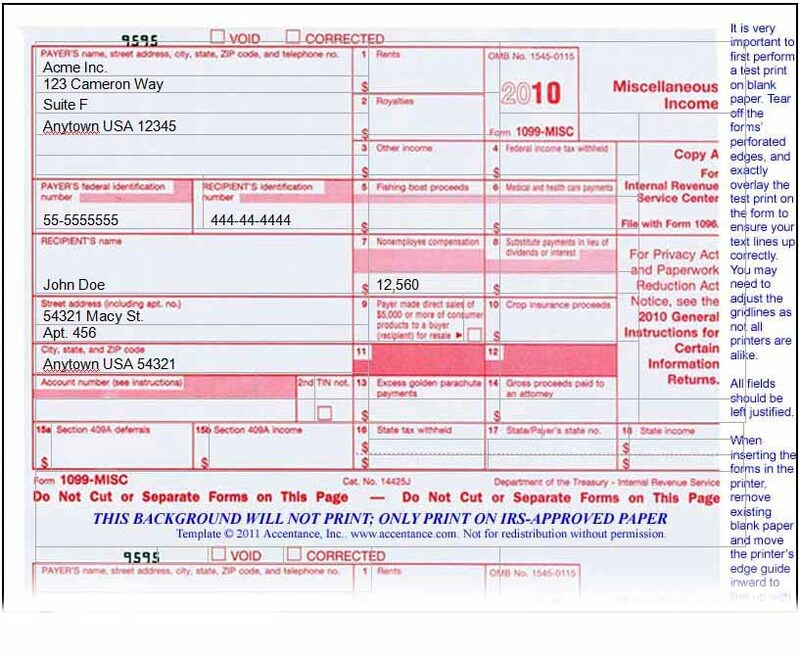 It's a one-page Microsoft Word document with gridlines overlaid on a background picture of the tax form (except your background will say 2015 not 2010). The background or gridlines do not print - only your data does. Many thanks – You’ve saved me from many headaches! I was able to get everything done quickly this morning and I feel like a load has been lifted off my shoulders. What a deal! Thank you for making my life as a small businessman easier. Template works perfectly. Thank you!!!!! This has saved me HOURS of work. Awesome!!!! Thank You So Much! It's done, it works, and it's made me very happy!!! Thank you, the template worked perfectly and cut down my workload by hours. Smart Concept!!!! The 1099 misc template is just what I needed. It is super easy to use and they print wonderfully. I had been searching for the last couple of weeks on the internet for a 1099 template with no luck before finding your website.